With the rise of numerous gadgets and applications for vectoring, photo manipulations, 3D modelling and illustration, the old pencil and paper are least getting noticed, kept inside drawers and sometimes never used again. I remembered attending a graphic design convention where one of the speakers (from an animation studio) forgot what is that “writing instrument with graphite” called. Everyone laughed when the audience figured it out for him that he is referring to a “pencil”. Every creative person and even those who are not into design work might have used a pencil or a pen and a paper at some point of their work process. But with the popularity of sketching applications on tablets and other devices, the traditional way of conceptualizing an idea on a piece of paper are replaced by virtual sketch pads and sticky notes. This article will teach you the importance of sketching and how your pen and paper will help you in conceptualizing and building your next successful design work. Take time to shut down your laptops and set aside those drawing tablets for a while as I give you some benefits of sketching your ideas first on paper, how other designers benefit from it and some tips on getting it started. There is always that creative feeling when you are holding a pencil than holding a mouse. It gives you more freedom to illustrate what’s in your mind on paper than on a computer. By means of drawing rough lines and shapes, you begin to use that spark of creativity within you to come up with interesting concepts that can be the initial foundation of your next awesome design work. Sketching doesn’t only happens in your work table. It can took place anywhere you need to record something, list an idea or just be inspired by the environment you are in. Bring a small notebook and a pen everywhere you go. Who knows, you might just find notable ideas as you go. You might meet a potential client while not at work or in public places and you might talk about things relating to your design work. Your pen and notebook in hand can be a great communication tool. Through rough sketches or just showing up your sketchbook, you can easily describe what you do and your creative process for an instant client work. When you start your project with a sketch, you will not limit yourself with a single variation of your idea. Through sketching, you can explore multiple options you could take in a particular design concept. Oftentimes, when you still have nothing in mind, scribbling and doodling triggers your imagination and gives birth to the awesome idea you’ve been figuring out for hell years! As a designer, you must be equipped with that extra skills you use in your design work. By means of sketching, one important skill is developed, drawing. The ability to draw and visualize things on paper instantly can be your greatest weapon. A designer who can easily illustrate his ideas or concepts will most likely win a client over those who can’t even draw a distinguishable object. Also, by sketching, you might just discover your other skills like art direction, creating storyboards or character designing. Ok, sketching is pretty cool but how can I get started? This is the big question that might comes out of your mind. Well, I know that there is always that feeling of doubt when you are facing a clean blank sheet of paper and that hesitation of what to draw and where to start. Fortunately, I have listed some effective tips you might give a try to get started with sketching. 1. Start by listing some words/terms/initial thoughts that best describe your idea. These words, when properly analyzed can give you the starting point of what to sketch. 2. Don’t be afraid of mistakes. Remember you are sketching to come up with INITIAL ideas to be used for your FINAL designs. So mistakes are inevitable and most of the time, they give rise to new opportunities and better ideas. 3. Sketch anything and anywhere. Bring with you a pen and a sketchbook or a small notebook wherever you go. Sketch anything that you think are interesting and can be an inspiration for your next designs. Do it in a subway, a park or in a restaurant. Some of the most brilliant ideas might come across your way at an instant so better be ready to record them. Image banner via Almost Never Clever. Now it’s your turn! 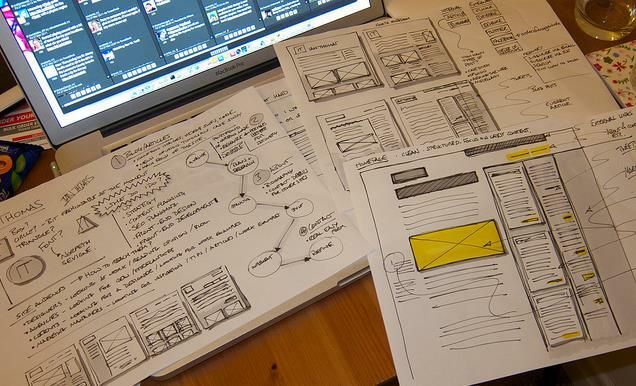 How important sketching is in your design work? Share us your thoughts and comments by leaving a message below. Stay awesome everyone!